Gatlinburg is nestled at the entrance to Great Smoky Mountains National Park, the most visited national park in America. The city attracts more than eleven million visitors per year and can grow to a population of more than 40,000 on any given night. Gatlinburg is one of America’s great mountain resort destinations, with accommodations of every kind, dozens of local-to-national restaurants, and attractions galore—all nestled in the foothills and surrounded on three sides by the natural beauty of the Great Smoky Mountains. “When we started looking at apps, we knew we needed to have the “Official” App for Gatlinburg that provided current information directly from our businesses,” said Angela Carathers, Interactive and Social Media Manager for Gatlinburg CVB. A front-line tool. 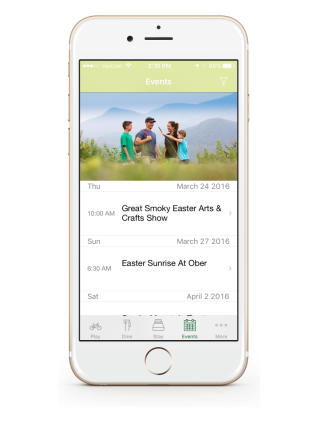 The Gatlinburg app isn’t just for visitors. In fact, they’ve incorporated their app into front-line hospitality training as well. Hotel staff have reported tremendous results with encouraging visitors to download the app or using it as a handy resource for the most up-to-date information. Easy to use. One of Gatlinburg’s requirements for the app was that it had to be easy to update. With frequent content update needs, Gatlinburg relied on having a tool that wouldn’t make editing a chore. Through the Mobile App Studio, the staff reports spending just a few hours a week managing the app’s content. Well-promoted. 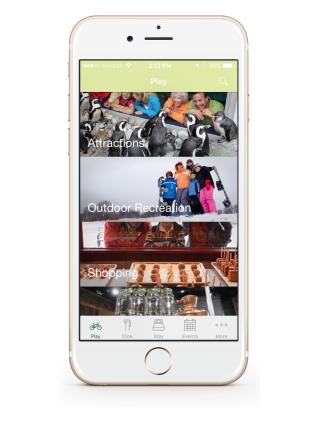 Gatlinburg attributes much of their app’s success to strategic, ongoing promotion. They encourage visitors to download the app in their vacation guide, in-room guide, and all other print materials they produce. They also gave the app its own landing page on their website and promote it on social media. Brand compliant. Gatlinburg sees the app as an extension of their brand. With the ability to update content and make it live at any time, they can feel confident their visitors and front-line staff always have the most up-to-date information at their fingertips. In 2015, Strategic Marketing and Research Insights (SMARInsights) conducted a research study on the effectiveness of the Gatlinburg app and its impact on visitor behavior and experience. Using the app itself to conduct the study via push message survey, 461 respondents of varying demographics weighed in on how they planned their Gatlinburg trip and what their experience was like. Seventy-seven percent of respondents rated the app as “excellent,” compared to only 47% of respondents giving the same rating in Gatlinburg’s 2014 ROI research. This yields a percent change of 64% higher satisfaction over visitors who did not take the survey, inferring that better in-destination experiences lead to more likely second trips. 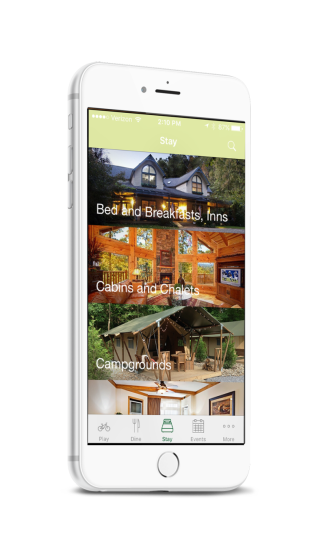 Among survey respondents who used the Gatlinburg app to plan their trip, the app is responsible for more than 1,000 trips and nearly $1.4 million in incremental spending. Compared to those who saw advertising before their trip, the app-influenced travelers spent a total of $381 more per trip, resulting in $4.4 million in incremental revenue. In total, the app generated nearly $6 million in incremental spending in Gatlinburg from 2014-2015. Given their tax revenue rate of about 11%, this represents $662,000 in incremental tax revenue and a tax ROI of $77.95.